Just a few weeks ago, the groundhog saw his shadow, predicting an early Spring. We can all hope for it! The good news is that as I post this, it's raining here -- not snowing! To get you in the mood for the spring season, Jillian at JillianBean Crafts assembled a group of terrific bloggers to post their most Spring-inspired project(s) on the Spring Fever Blog Hop. So welcome! If you're joining me mid-hop, please be sure to go to the Hop start, to our fantastic hostess's site at Jillian Bean Crafts. Hop along and don't miss a single site, you'll be inspired! At the bottom of this post, I'll list the entire line-up, as well as your next stop at Made by Momo. Here is what I made in response to Jillian's challenge to make something "light, springy and fun"! I made a decorative pomander floral ball. At the top, I removed some of the styrofoam ball and inserted a cachet of lavendar, to get a hint of the coming season. I used my Fairy Cut software package to create two different sizes (1" and 1.5") of the flowers with five petals. Arranged tightly on each single sheet of 12"x12" pink Bazzill paper, I was able to cut 131 of the 1" flowers on one sheet, and 56 of the 1.5" flowers on another (I cut 2 sheets of this size). UPDATE: Crafters who post to today's post here on CardMonkey will be entered into February's monthly drawing for a FREE Fairy Cut Software license (a $99 USD value! ), generously provided to me as a monthly prize to my followers by the manufacturer. See Blog Candy below! I adhered the flower to the styrofoam ball using thin (27mm) dressmaker's pins that I first inserted into pearl beads (half-price at Michael's this week). I wrapped an inexpensive candlestick in wide, pale green satin ribbon, and capped the floral ball off with a butterfly clip I purchased at ACMoore, 3 for $1.00. Note too that I decorated the inside of the card, with complementing artwork and coordinating paper strips. The envelope (not shown) also has the same coordinating paper strips. Doesn't this just put you in the mood to get your garden growing?! NOW, who is in the March mood for some BLOG CANDY!? I am offering a fun gift box of "how does your garden grow" embellishments, along with a Xyron 1.5" sticker making machine! 2. Leave a comment for me here. Please include a way to contact you when you've won the prize. NEW! 3. If you would like to be entered into CardMonkey's February drawing to receive a FREE Fairy Cut license (a $99 USD value), please let me know that in your comment. It's easy to use with your computer and Cricut, so don't think you're not ready for this adventure in expanding the possibilities of your cardmaking or scrapbooking! The manufacturer notifies me of the winner and e-mails this prize directly to the winner ... how great is that!? Thank you, William, at FairyCut for this generous prize to my followers!! Thank you for joining me today for the Spring Fever Blog Hop! And wild appreciation again to Jillian at Jillian Bean Crafts for hosting this hop! I love it, absolutely creative and beautiful! Sorry, I forgot to leave my email....I love it, absolutely creative and beautiful! That is a beautiful project!!! LOVE it :) TFS! Thanks for sharing. I'd love to be entered in the drawing for the Fairy Cut license as well. Ellen Very pretty!! I see those styrofoam balls at Michaels all the time and I just look at them and think I would love to do something with them. I think now I might. Thanks for the inspiration. I have made something similar last year with my girls. This is lovely! I love purple! I became a follower and hope u can become one of mine. I love this project! I wanted to make something like this for my wedding. TFS!!! wonderful projects, I would love to be entered into the drawing, I am now a follower of your great blog. I love your projects...they're just so pretty! Thanks for the chance to win; I'm already a follower! What a cute and inventive project!!! I would love to be entered in the Fairy Cut Drawing! This program looks like it's as amazing as your creation. Thank you so much for sharing. I have followed your blog for sometime now. The pomodore & card are so beautiful! The pomodore would make such a great center piece for so many occasions. I would also love to be entered for the "fairycut"
So pretty! Thanks so much for sharing. I am a new follower as well.! I'd love to be entered in the Fairycut license. Thanks for the chance to win. WoW! That must have taken hours! Both are lovely and must smell pretty. I would love a chance for a Fairy cut. Oh m'gosh! This is beautiful! I love all of those tiny little pink flowers! What a fabulous project! Love the luscious, satin ribbon as well and the pretty matching card. GREAT take on the challenge! I've been looking into the Fairycut software and trying to decide which program is best for me. Looks like you're a pro at it! Thanks for the chance to win! Your project is so pretty and perfect for spring. Always a great idea! I can almost smell the lavender. Hope I win the bog candy. Thanks for the chance to win the blog candy and I've never heard of Fairy Cut, so I'm off to Google it and if you say it's a wonderful then I would love to be included for a chance to win! Thank you! What a great way to welcome in the spring. I really like how you added the lavendar in the top for the perfect touch. thanks for a chance to win! I have been looking into software to use with my cricut!! So YES!! Count me in please!! What a pretty pomadore. I like the idea of hollowing it out to add the lavendar scent. The card is very springy too. TFS. I'm following now & although I've never heard of the Fairy Cut, I would love to be entered into the Feb blog candy too. I am a new follower! Very pretty Spring project. I would like to be entered in your February drawing as well. It will be a new adventure for me if I win! Wow, that is very cute! I am excited for a chance to win and can't wait to learn more about Fairy Cut. What beautiful projects. Looks very much like spring. I learned about the fairycuts softwear just yesterday. Thanks for the chance to win one. I love your project, oh I am so ready for spring. I never heard of fairy cuts software but after looking at it I would love to win a copy of this. LOVE your flower topiary and your card. SO pretty! I would love to win either prize. Thanks for the chance! I'm already a follower. Your project is beautiful and love your card. I would love to be entered into your February drawing to try the Fairy Cut. Thanks so much. Such beautiful projects... definitely pust me in the mood for Springtime!! Thanks for sharing your ideas with us!! I would absolutely LOVE to be entered in you Fairy Cut license giveaway... thanks for such a great opportunity!! That flower is superb and the card is gorgeous - what creativity! TFS! Gorgeous! This must have taken you forever! Please enter me in the Fairy Cut drawing. Gorgeous Card! love it!I am already a follower! would love to win the free fairy cut license! Loved your project...I am SO ready for Spring! I would love to be entered in the February drawing for a FREE Fairy Cut license. VERY AWESOME! Fabulous Project! So creative! I would love to be entered the the fairley cut drawing! Thank you for that opprotunity! I also am way excited about your personal blog candy! Thank you so much for sharing! Incase I get a chance to be the luckey winner! What a beautiful floral ball! I love that used a candle... so creative! Both of your projects are so nice. The pearls on the floral ball look wonderful. I would also like to be entered in the chance to win the Fairy cut license. Wow! What an amazing project. The colors are perfect, the details are amazing. I just love the matching card too. love your projects. very talented. tfs! I would like to be entered in the Fairy Cut please. I am also a follower. Ellen your whole pomander project is beautiful. 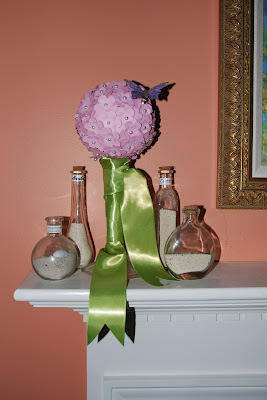 Nice idea to hollow out abit of the ball to add a scent and love how you ribbon covered the vase. Great job on all. Was just to the Fairy Cuts site, that looks like a very useful program, would love to be in the draw, thank you. Beautiful! I would love to be entered in the Fairy Cut drawing. Thanks for the chance to win! This is beautiful, and what a fun and creative way to bring flowers into the house! I'm also up for the Fairy Cut drawing... a challenge is always so much fun! Thank you again! I love this! It's so different from most of the projects I see on blog hops and it just speaks of the promise of Spring. Just discovered your blog today and have become a new follower. I'll be back to have a better look around after the hop. Thanks for sharing your creativity with us and for offering a chance at this awesome blog candy! Seriously cute project. Thanks for sharing .. and the chance to win. What a beautiful project. The idea of putting lavedar inside makes it that much better. I would live to be entered into your February give away, the program sounds so interesting. Gorgeous. Looks like a fun project to make. Thanks for sharing and the chance to win. I am a new follower and love your project. I would love to be entered for the Feb giveaway, I have been wanting to work my computer more into my crafting and just not taken the first baby steps yet! Love your card and the ball! I imagine the ball smells wonderful! I would love the opportunity to try out Fairy Cut :) I'm a new follower and I'd love you to check out my blog too... My e-dress is in my Blogger Profile! Wonder Spring Project and your matching card is just so pretty! TFS. Amazing what an elegant project you were able to make for the amount of money you spent! I would love to be entered in the Fairy Cut drawing! That is a beautiful project! So creative, thank you for sharing. SO pretty. I'm SOOOOO looking forward to spring. Your project is great and look like it too some time to put together. I am going to check out the Fairy cut program, sound interesting. WOW!! beautiful with the butterfly and the card is so lovely!! TFS and would love to be entered into your February giveaway also. I'm your 380th follower too YAY!!! Thank you for the chance! The pomadore is beautiful and I love that you added the butterfly. Thanks for sharing and the oppoirtunity to win. I love it Ellen, and I scrolled down and love the box you came up with, you rock! Ellen the pomadore is Gorgeous, I love it!!! And the matching card is just a beautiful as well! I'm already a follower and I'm very excited to have the chance to win the Fairy Cut license!!! Thanks for sharing your amazing work! Love the projects. I would love to be entered in the drawing for the blog candy and the Fairy Cut license. Oh my gosh, this is so cute. My sister's baby shower is right around the corner and this would add a cute decorative touch to the food tables. Thank you for the inspiration. Wow Ellen - this is amazing! Makes me thing of spring for sure - like it might actually happen :) I would love to be entered in the drawing for the Fairy Cut Software. I don't even know what that is but if it helps you create things like this easily, who wouldn't want it? I am a long-time follower of your amazing blog and loving every minute of it. Thanks for such a great projects, yes it did get me in mood for a spring garden! TFS I am a follower. Beautiful as always Ellen. Absolutely stunning bouquet. Gorgeous project and definitely makes me think spring!!! I would love to be entered for the Fairy Cut drawing and the additional blog candy give aways!! Thanks for sharing your creativity and giving us hope that spring is just around the corner! Amazing and creative projects! Thank you for the chance to win! Hopefully Spring will come soon! What a great inspiration! So pretty! Love it. I'm already a follower. I would also love to win the Fairy Cut Feb giveaway!! What an awesome project, its so beautiful and purple is my fav color ☺ Im a new follower on the hop with you! and yes please enter me in, who couldnt use more stuff to make with our Cricut! Your pomader is beautiful. The colors just make you feel good. I'm a new follower. Yes, please enter me in your drawing. Beautiful pomander!! It definitely makes me wish that it was warm enough to plant my garden. ch a super spring project!! I am so impressed. I love your color choices too. thanks for the chance to win. Your project came out very nice. Please include me in your drawing for a FREE Fairy Cut license. I just found your blog via the blog hop. I love your project! Please enter me inot the Fairy Cut drawing. I would love to be entered into the fairy cut! Wonderful idea to put lavender inside. What a wonderful idea and it even smells good. I'm a ne follower and would be happy to be entered in to the extra drawing. TFS and a chance to win. I love the idea of adding the fragrance! I'm a follower and would love to be entered in the february drawing for the Fairy Cut Software! Thank-you for the spring inspiration and a chance to win some great blog candy! I am a brand new follower after just finding you through this hop! I love the project! I want to make one now! I would also love to be entered into the contest to win the Fairy Cut software too! Thanks so much! Cute project!! Thanks for sharing!! Such a great idea! Definately gets me ready for spring! I'm a new follower and would love to be entered in the Feb. drawing. Thanks! Beautiful pomander and card! I am a follower! Your projects are so beautiful! I love that flower with the butterfly! I love love the pomander its amazing. Being a party planner I will have to try this idea it would look amazing as a centerpiece. I am a new follower! I would love to enter the Fairy Cut Drawing. And if you can check out my blog its part party planning part crafting. Thanks for the chance to win. I love your floral ball - it's so beautiful. Great job! I'm already a follower. Thanks for sharing and for the opportunity to win. I would also like to be included in the Cardmonkey's drawing for the Fairy Cut software. Love the pomander, so cute! So springgy love the idea of the lavender. I software would love fairy cut, I love the smell of Spring in the air. I became a follower. Beautiful spring topiary project! I'm actually working on something similar right now too. Hey, great minds think alike! Thanks for sharing. OMG! What a great project. Love this. Fairy is new to me. I have to check this out! TFS! Wow this is just beautiful. Love it. I'd love to be added to win the Fairy Cut Software. I am a follower. Thanks for the chance to win. I JUST learned about Fairy Cut and found your Blog. I'm a follower now! Thanks for the opportunity to win one! What a beautiful, springy idea! Thabnk you for sharing and for the chance to win! Love your project and I also love that butterfly, I am nuts about butterflies. Thanks for the inspiration. 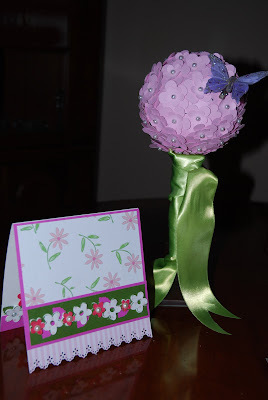 Love your lavender ball and the card is very pretty. Great idea for making the pop dots. I forget to buy them sometimes too. I am a new follower and love your blog. Your floral ball is so pretty, would be perfect for a wedding favor. TFS! I've never heard of Fairy Cut, but I'd love to give it a try. What a great idea! You're so creative! TFS! Im already a follower! love that purple, your project is a perfect spring color! love that! what a fabulous idea! it would make a great little hostess gift! I'll have to try it! I am a new follower and look forward to more of your creations! Lovely project and a great spring hostess gift for an Easter gathering! I'm a follower now and I'd love the chance to win the Fairy Cut license too! TFS and the opportunity. How creative, you project looks so nice!